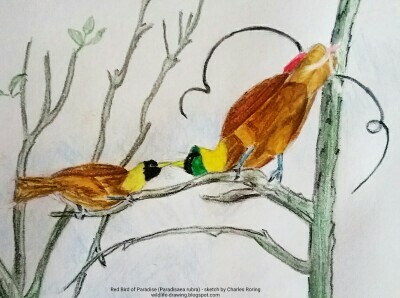 Here is a watercolor sketch of Red Bird of Paradise (Paradisaea rubra) that I saw in tropical rainforest of Raja Ampat. I was guiding three visitors from the United States and from India in eastern region of Waigeo island when I saw the birds in high tree. 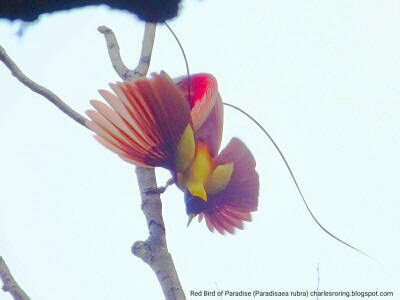 Waigeo is also the natural habitat of Wilson's Bird of Paradise. They spent nearly one week traveling around northeast region of Raja Ampat islands to watch birds. It was a long tour covering three regencies in West Papua i.e. Raja Ampat, Sorong, and Manokwari. We started the tour by leaving Sorong city for Sopen village in northeast of Waigeo island. First, we went snorkeling at Isanak beach and then we enjoyed birding and camping in the jungle. Later, we explored uninhabited islands and grilled freshly caught fish by the beach. We watched Red Bird of Paradise early in the morning after spending one night camping in at the bank of Mamdifu river. It rained a lot and I could not sleep well. It was not only paradise birds that we saw in Raja Ampat. We also saw kingfishers, sulphur crested cockatoo, sunbird, brahminy kite, hornbill, rainbow bee-eater, black noody, tern, pink spotted fruit dove. The Red Birds of Paradise were dancing in high trees. It was not easy to take pictures of them. But I saw the courtship dance performance of the male bird when trying to attract the female bird. I think it will be a great idea if I could provide a sketch of the birds and present it in this website. I hope that readers of this Wildartlife.com will have an idea of how the female and male Red Bird of Paradise look like. Male is more beautiful than the female. He has got red, yellow, brown, and green feather. I draw the sketch using pencil and then color it with Derwent Watercolor Pencils. We continued our trip to Klasow valley in Sorong regency where we saw Lesser Birds of Paradise, Cassowary, Moustached Treeswift, and a lot of other birds that live in lowland rainforest of West Papua. To enhance the birding tour, I provide 10x42 mm binoculars and spotting scope to the visitors. We also provide Birds of New Guinea by Thane K. Pratt and Bruce Beehler as the most recommended field guide book. There is a nice forest located in northwest area of Manokwari where visitors can enjoy hiking, camping, and birdwatching. Its name is Mesirrokow river. It is an ideal site for visitors who want to watch Blyth's hornbill, Sulphur Crested Cockatoo, Eclectus Parrot, Little-ringed Plover, Willie Wagtail and Brahminy Kite. The lowland forest is also the natural habitat for wild pigs, soa-soa lizard, cuscus possum, wallaby and deer. Most visitors who go to Mesirrokow river, stay there for 3 to 5 days. We provide tents, eating and cooking utensils as well as birdwatching and wildlife watching equipment such as 10x42 mm binoculars, 20-60x60 mm spotting scope and a laser pointer. At night, we will use solar powered rechargeable batteries to provide lights in the tents.